Whether you're sauteing foods or preparing risotto, this is the quintessential piece for any chef's kitchen. 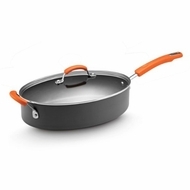 The deep, straight sides of this entertaining size saute pan lend room to any party size dish. Used for sauteing meats and vegetables, frying chicken, pancakes, eggs, or grilling sandwiches. Deep sides give extra capacity so that you can braise, stew, deglaze, or add additional ingredients after browning for recipes such as chicken and rice or paella.